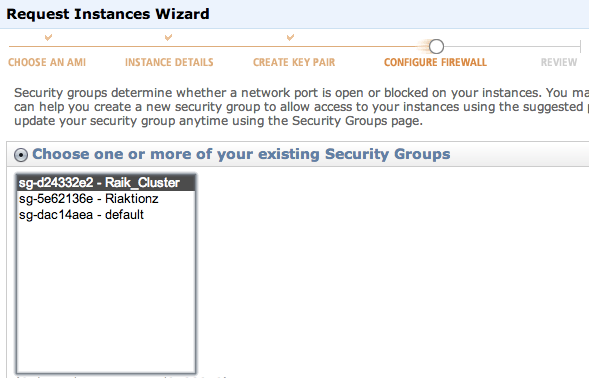 I wanted to write up an intro to getting Riak installed on AWS, even though the steps are absurdly simple and already available on the Riak Docs site, there are a few extra notes that can be very helpful for a few specific points during the process. 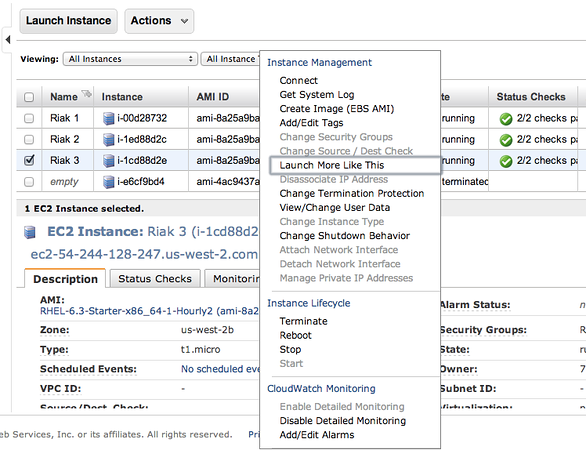 Start off by logging into AWS. At this point you can take two different paths that are almost identical. 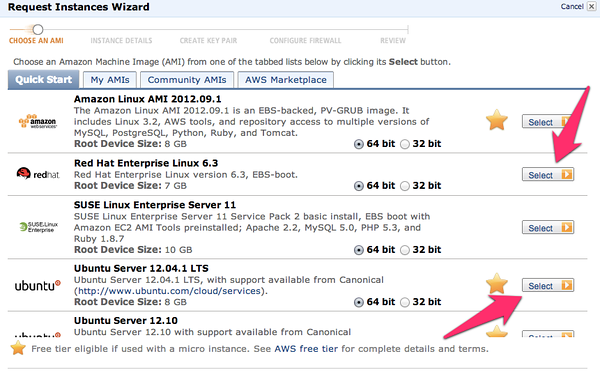 You can follow the path of using the pre-built AWS Marketplace image of Riak, or just start form scratch. The difference is a total of about 2 steps: installing & setting some security port connections. I’m going to step through without using the prebuilt image in these instructions. Now add the following three and assign the security group to the ports; 4369, 8099 & 6000-7999. For the source set it to the security group id. Once you get all three added the list should look like this (below). For each rule click the Add Rule button and remember to click the Apply Rule Changes. I often forget this because the screen on some of the machines I use only shows to the bottom of the Add Rule button, so you’ll have to scroll down to find the Apply Rule Changes button. For creating virtual machines I just clicked on Launch Instance and used the classic wizard. From there you get a selection of items. 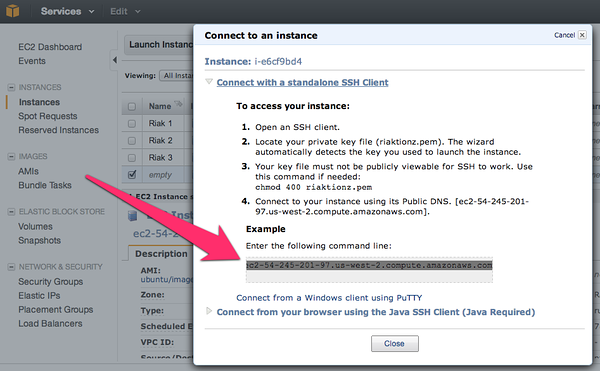 I’ve used the AWS image to do this, but would actually suggest using a CentOS image of your choice or Red Hat Enterprise Linux (RHEL). Another great option is to use the Ubuntu 12.04 LTS. Really though, use whatever Linux version or distro you like, there are 1-2 step instructions for installing Riak on almost every distro out there. NOTE: For other installation methods, such as directly downloading the RPM or other Linux OSes, check out the https://docs.riak.com/riak/latest/tutorials/installation/Installing-on-RHEL-and-CentOS/. That’s it; all done. 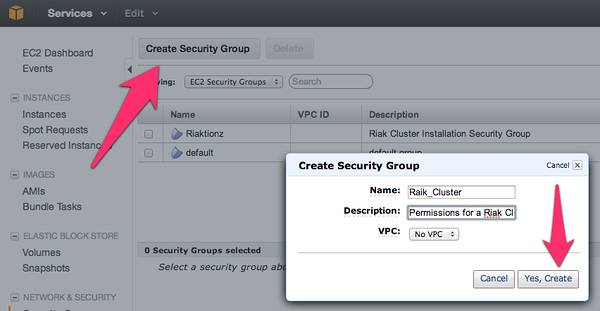 You now have a Riak Cluster. For more operations to try out on your cluster, check out this list of basic API Operations.